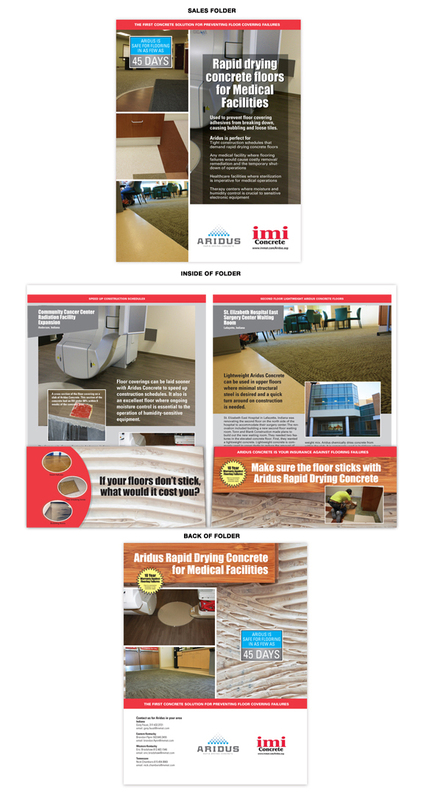 The top photo shows the Aridus Sales package, which included a Sales Brochure, a Sales Folder, and a series of Case Study Inserts that showcased either medical facility or school construction projects that used Aridus concrete. Aridus is a fast drying concrete that allows finished flooring (carpet, linoleum tile, etc.) to be adhered to it in a short amount of time. A key component of concrete is water, which evaporates as the concrete cures over time. However, in a quick turn construction project, conventional concrete may not be ready for flooring. The escaping water vapor can break down the adhesives and the flooring will break loose, form bubbles, or sporadically delaminate. We targeted general contractors who build health care facilities and schools because they are often on a fast track construction schedule. We followed several of these projects using Aridus concrete, visually documenting the pouring and curing of the concrete until the finished flooring was applied. 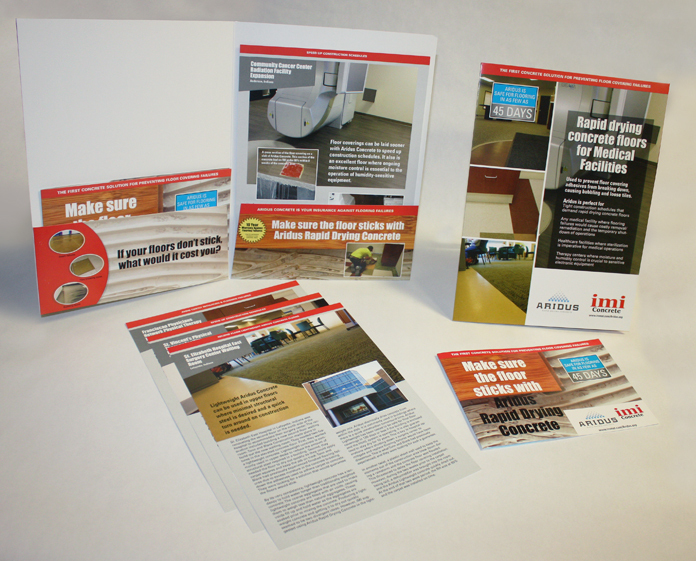 We worked with the Quality Control staff at IMI and interviewed contractors installing the floors. 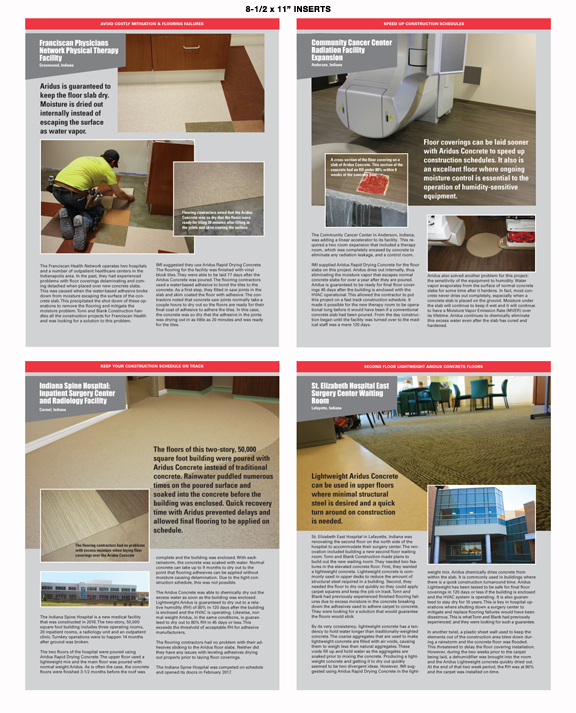 We produced a series of case studies that told the story of the quick drying floors. We used these on both the company's web site (click here for an example) and in print form as inserts for a sales folder. 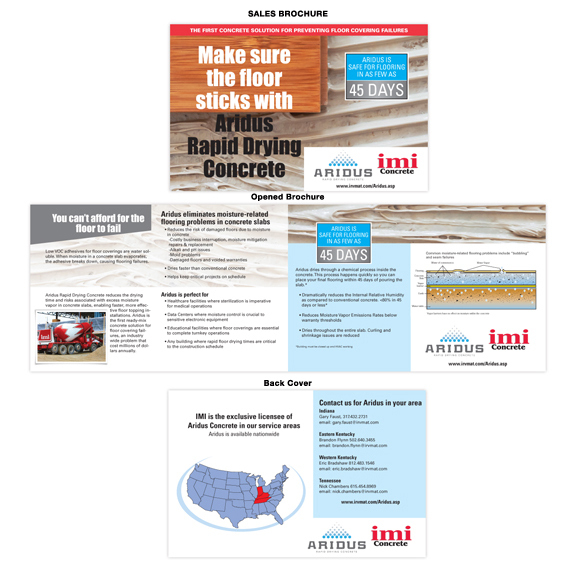 We also produced a brochure that explained how Aridus is a chemically altered concrete mix that eliminates water at a rapid rate. The folder, brochure and inserts were designed with the IMI Sales Representatives that were in charge of selling Aridus so they were effective and functional. 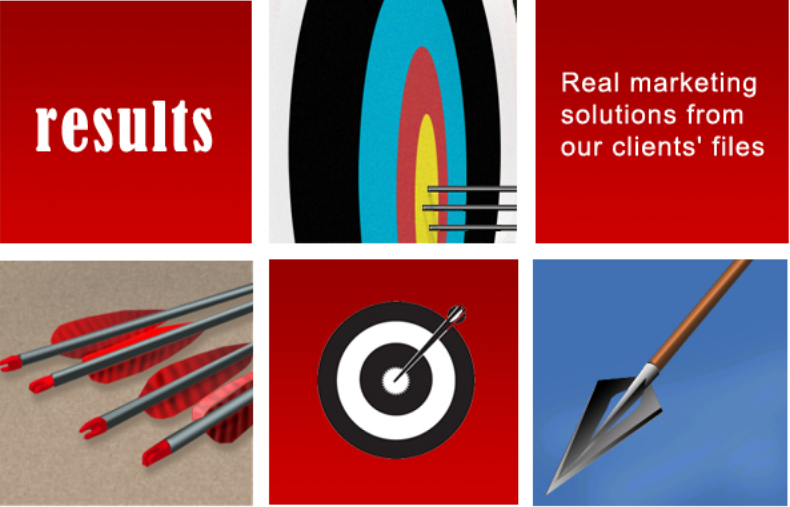 "No one outside of our company understands our business as well as Yaney Marketing. They understand our product. They understand our customers. They get it!"